This Head-Up Speed Display projects your SPEED, RPM, VOLTS, and AIR or WATER TEMP right on the windshield. (Just like the Air Force use in their planes to display Pilots information on their windshield) You may also set over-speed warning with the touch of a button. When the preset speed limit is exceeded, a visual indicator lights up and optional alarm beeps (for up to 15 seconds) to remind you of the speed limit. At 62 MPH, looking down for a second to check the speedometer means driving blind for 88Ft. Many accidents start during the time a driver glances down and fails to see sudden traffic changes ahead. Now, drive safely by never looking down to check speed again with this Head-Up Display. It may also help reduce the chance of receiving speeding tickets. Just a few wires to bring in power and measuring inputs and an included temp sensor for accurate readings. 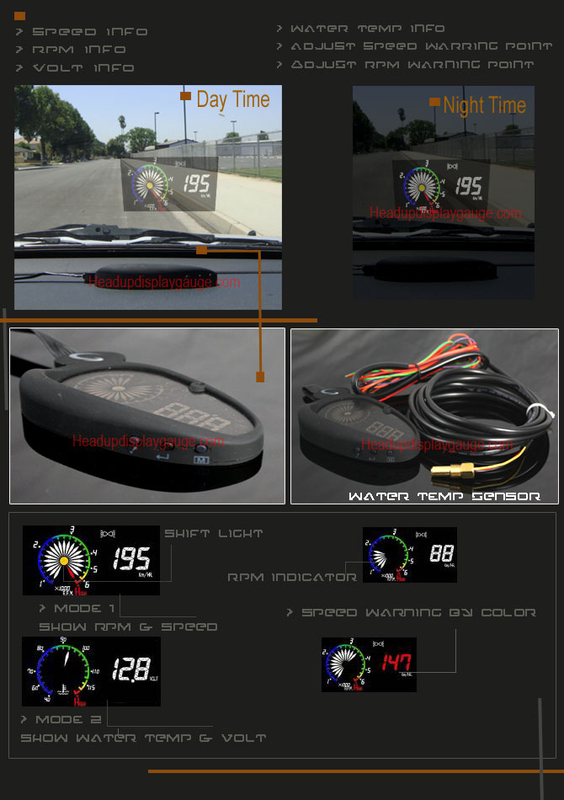 The Heads up Display is $249 and is available with KPH speed readings. MPH readings are not available at this time, sorry. Copyright 2010 Tom's Digital Electronics (Tom Sweet). All rights reserved.